LONDON — Mesut Ozil made a winning return as captain with Pierre-Emerick Aubameyang scoring twice to earn Arsenal a 3-1 victory over Burnley in the English Premier League on Saturday. 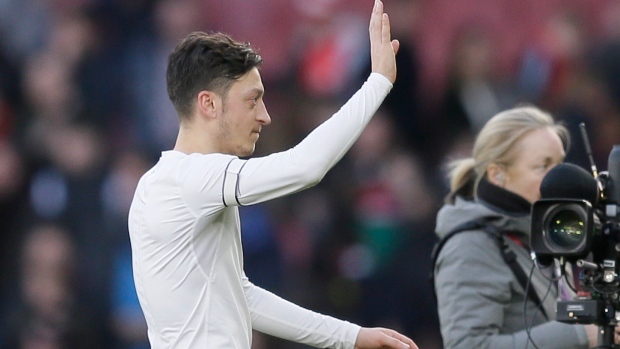 Ozil's inclusion as captain, for his first start in the league since Nov. 11, came after Emery said on Friday that the German playmaker was not assured of a place in his team. The 30-year-old Ozil set up the opening goal after 14 minutes with an exquisite pass that freed Sead Kolasinac, who crossed for Aubameyang to end a four-match run without a goal. Fifth-placed Arsenal made it 2-0 early in the second half when Kolasinac rolled a pass to the feet of Alexandre Lacazette and he set up Aubameyang for his second goal of the afternoon. Ashley Barnes, who was involved in several angry altercations with Arsenal players, scored for relegation struggler Burnley before Ozil laid on a stoppage-time strike for Alex Iwobi.